We are invited to my daughter’s house for a cookout. There will be hamburgers (D and I will have lettuce wraps) and french fries. I plan to take Faux Sweet Potato Fries made with kabocha squash as our potato alternative. I included recipes for fries and chips made from fresh pumpkin in Carb Wars, and posted some recipes on my blog here and here, but I recently tried using kabocha squash instead of pumpkin. Kabocha (pronounced, kah-bow-cha) is a Japanese pumpkin that is available most of the year while fresh pumpkins are only available in the Fall. They have about the same nutrition counts as pumpkin, but they are like a cross between butternut squash and sweet potatoes in texture and taste. Kabochas look like squat pumpkins; they have dull, bumpy, green or orange (usually green) rinds and orange flesh. I’m going to make an oven-fried version today. I’ve made them a few times already and they are fabulous! I’d prefer them over potato fries any day! Kabochas have a very hard rind. Puncture it in a few places with the tip of a knife so it won’t explode and microwave it for 2 or 3 minutes to soften it up. Cut it in half and scrape out the seeds and fibers. Cut the halves into 1/2-inch wedges and peel. Cut off the thinner end of each wedge and reserve for another use. Fry in small batches in fresh, high-heat oil, such as light olive oil, in a deep fryer at 365ºF until golden brown and crisp. When all the strips are cooked, return them to the hot fat briefly to reheat and crisp before serving. Drain on paper towels and sprinkle with salt. Preheat oven to 375ºF. 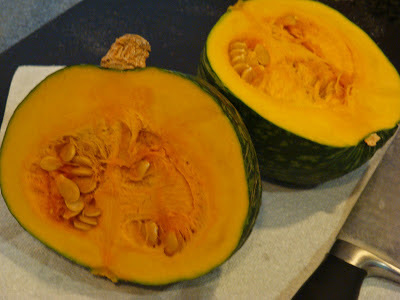 Place squash slices in a bowl with 2 tbsp. light olive oil, sprinkle with 1/2 tsp. salt, and toss to coat. Place squash slices flat on a heavy, shallow baking pan. Bake for about 30 to 40 minutes or until browned and crisp, stirring and turning at least once about halfway through. Add additional salt if needed, and serve hot. A 2-pound kabocha, large end only, will make about 24 large fries or 4 servings. Kabocha Squash, Oven Fries. Bookmark.